The Loudoun County School Board voted unanimously Tuesday night to appoint Chris Croll as the board’s Catoctin District representative. The seat was vacated in late October by Eric DeKenipp, who resigned with 14 months left of his term. Croll is a familiar face to many Loudoun families, teachers school administrators. She founded Loudoun County Parents of Gifted Students a support group for gifted parents, as well as a parent consulting group that educates and supports families nationwide. She is a member of the school system’s Special Education Advisory Committee, the Gifted Advisory Committee, and the School Board-appointed Special Education Ad-hoc Committee, and a delegate on the Minority Student Achievement Advisory Council. During a candidate question-and-answer session with the board last week, Croll said she would advocate for students in vulnerable populations, including minority students, special education students, gifted students, English language learners, economically disadvantaged students, and rural students. These student populations require “a little extra love and attention,” she said. The five candidates were: Jenna Alexander, the director of the Hunt District PTA and small school activist; John Beatty, an IT director and computer science teacher at a private school in Maryland; Zerell Johnson-Welch, an attorney and former chairwoman of the Minority Student Achievement Advisory Council; Bob Ohneiser, an attorney who represented the Broad Run District on the School Board from 2004-2011; and Amy Tribié, the president of Lucketts Elementary School’s PTA and former music teacher. The last time the School Board appointed a member was in 2011, after the death of longtime School Board member J. Warren Geurin. Following Guerin’s wishes, the School Board voted unanimously to appoint Brenda Sheridan to the position, and she’s since been elected to two terms. 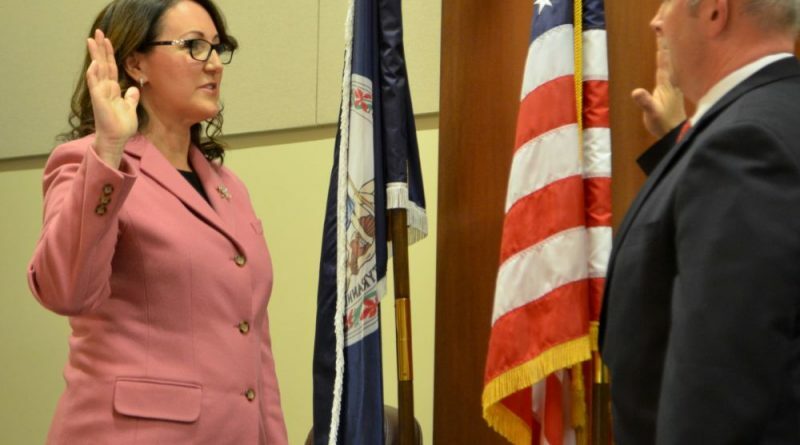 Immediately after the board’s vote to appoint Croll, the new board member was sworn in by Clerk of the Loudoun County Circuit Court Gary Clemens. Croll will serve the remainder of DeKenipp’s term, which ends Dec. 31, 2019. Still not clear why there wasn’t a special election for the people’s seat. We have an upcoming special for a vacated state senate seat. I’d offer this is more important to the voters of the Catoctin district, yet we get no say? Why would you say that when someone just got appointed? Weird. That said, I hope the entire County takes those words to heart and we get a full slate of independent candidates for each district. IMHO, there is one good SB member and the rest need to get replaced in November. Get your campaigns ready for some major disruption in 2019.